Doug TenNapel. Photo by flickr user "5 of 7"
This month’s book is “Ghostopolis" by Doug TenNapel. In this graphic novel, Garth Hale's adventures begin when he's accidentally zapped into the spirit world. Doug TenNapel is currently considered a "single author." If one or more works are by a distinct, homonymous authors, go ahead and split the author. 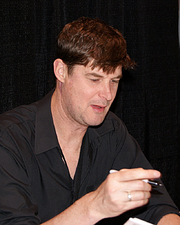 Doug TenNapel is composed of 4 names. You can examine and separate out names.